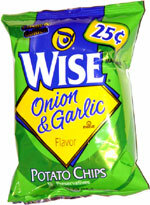 Taste test: These are good, very tasty onion and garlic chips. The seem to have a fairly even mix of onion and garlic. 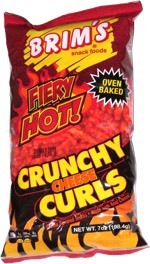 A few of the chips near the bottom of the bag were dark around the edges (possibly burnt), which is typical of Wise chips. This small bag was a pretty good deal, as it cost just a quarter but contained a good number of chips, and the ones near the top were unbroken. Smell test: A sweet onion aroma. Good.